By 1717, there was a strong demand for halfpennies and farthings, and there was no time for the Royal Mint to conduct further experiments in production of its own copper blanks from raw metal. Copper coins were minted using rolled copper fillets or strips, ready for cutting into blanks by the Mint before striking. 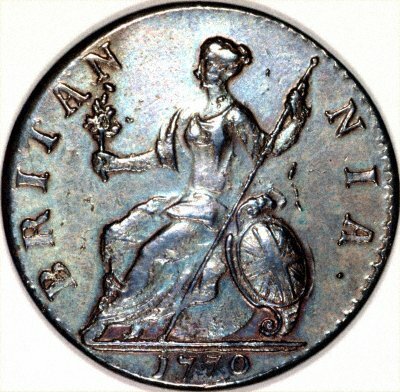 The new issues were struck in high relief, and produced attractive coins, although this also caused production problems such as weak striking. The very first issues were made on small diameter thick flans, and are now know as "dump" issues. From 1719 a thinner, larger diameter was used. The copper coins of George II remained unchanged from those of George I, except for the obvious matter of an updated obverse portrait. The forgery of copper coins however became a significant problem, and new laws were introduced to control the problem. The forgers responded by deliberately altering the inscriptions, many of which are amusing. Strangely, we see far more forgeries of George III coins than we do of George II. The reign of George III is noteworthy for coin collectors. From 1760 to about 1815, most of the coinage was similar to previous issues. Change started in about 1797 with the issue of "Cartwheel" pennies, twopences by Matthew Boulton, and from 1816, the entire coinage was revised. In 1762 - 1763, a large issue of halfpennies was produced, all dated 1754, the last date of George II, whose portrait they bore. From 1770 to 1775, halfpennies were issued for George III, with his portrait and legends, but otherwise continuing previous designs. Similarly, farthings were issued from 1771 to 1775. As already noted, these were very commonly forged, usually with deliberately altered inscriptions.